Watch the complete Hollywood Walk of Fame star ceremony below. The Hollywood Chamber of Commerce honored Orlando Bloom with a star on the Hollywood Walk of Fame on Wednesday, April 2, 2014 at 6927 Hollywood Boulevard next to the TCL Chinese Theatre and Madame Tussauds Hollywood. “We are thrilled to honor one of the most popular actors of our time,” stated Ana Martinez, Producer of the Hollywood Walk of Fame ceremonies. “His fans from around the world are going to be very excited about this ceremony!” she added. 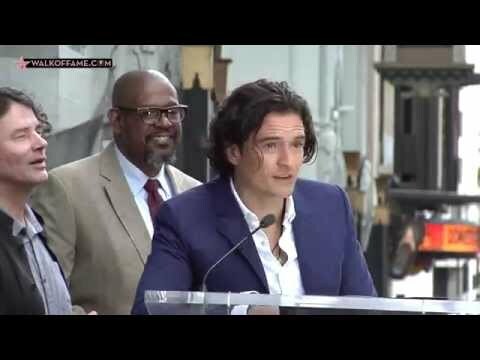 Emcee Leron Gubler, President & CEO of the Hollywood Chamber of Commerce and guest speaker Forest Whitaker and David Leveaux were on hand to help Orlando Bloom unveil the 2,521st star in the category of Motion Pictures at 6927 Hollywood Boulevard. The star ceremony was streamed live exclusively on www.walkoffame.com. Orlando Bloom was born in Canterbury, England and trained at the National Youth Theatre in London. He earned a scholarship to study with the British American Drama Academy. Having completed his scholarship, Bloom made his feature film debut in “Wilde,” starring Stephen Fry and Jude Law. In the summer of 2003, Bloom starred opposite Johnny Depp and Keira Knightley in the Jerry Bruckheimer-produced Disney hit, “Pirates of the Caribbean: The Curse of the Black Pearl,” directed by Gore Verbinski. Orlando then worked with Ridley Scott on “Black Hawk Down” and went on to star in Scott’s “Kingdom of Heaven” for 20th Century Fox. Bloom followed the epic Crusades’ film with his first contemporary American role starring opposite Kirsten Dunst in Cameron Crowe’s autobiographical “Elizabethtown,” directed by Crowe and produced by Tom Cruise for Paramount Pictures. In the wake of those blockbusters, Bloom made his debut on London’s West End in a revival of David Storey’s 1969 drama, “In Celebration.” Produced by Sonia Friedman and directed by Anna Mackmin, the production and Bloom were well-received by both critics and audiences alike. Bloom’s additional film credits include “Ned Kelly” opposite Heath Ledger; Wolfgang Peterson’s “Troy” opposite Brad Pitt; the Cayman Islands ensemble “Haven” opposite Zoe Saldana; “New York, I Love You” opposite Christina Ricci; Mark Ruffalo’s directorial debut “Sympathy for Delicious” opposite Laura Linney; Horton Foote’s “Main Street” opposite Colin Firth and Patricia Clarkson; and Paul W.S. Anderson’s “The Three Musketeers” opposite Christoph Waltz. Orlando made his producorial debut via his Viddywell Production Company in “The Good Doctor” in which he stars opposite Michael Peña, J.K. Simmons, and Taraji P. Henson. This past December, Orlando reprised his role as ‘Legolas’ in Peter Jackson’s “The Hobbit: Desolation of Smaug,” for New Line Cinema and MGM. The Limited Collector’s Edition Blu-ray 3D Combo Pack DVD and Digital HD will be available April 8, 2014 from Warner Bros. Home Entertainment. Bloom will next be seen in the final film of “The Hobbit” trilogy, “There and Back Again,” to be released on December 17th 2014. Orlando was appointed a UNICEF Goodwill Ambassador after he took his first trip to Nepal with the organization in 2007. In December 2012, he visited UNICEF supported programs in South Africa to help benefit children and refugees. This month, Orlando will visit Syrian refugees in Jordan with the organization. Bloom also works with Free the Children and spoke to 18,000 kids at their first “We Day” in California this year. Other charities and organizations he works with include Peace First, Make-A-Wish, and Global Green. The Hollywood Walk of Fame is an internationally-recognized Hollywood icon. With approximately 24 star ceremonies annually broadcast around the world, the constant reinforcement provided to the public has made the Walk of Fame a top visitor attraction. The Hollywood Chamber of Commerce continues to add stars on the Walk of Fame as the representative of the City of Los Angeles. The Walk of Fame is a tribute to all of those who worked diligently to develop the concept and to maintain this world-class tourist attraction. The Walk of Fame is open to the public. No paid admission or assigned seating at star ceremonies.It is understood that the cost of installing a star on the Walk of Fame upon approval is $30,000 and the sponsor of the nominee accepts the responsibility for arranging for payment to the Hollywood Historic Trust, a 501(c)3 charitable foundation. The funds are used to pay for the creation/installation of the star and ceremony, as well as maintenance of the Walk of Fame.